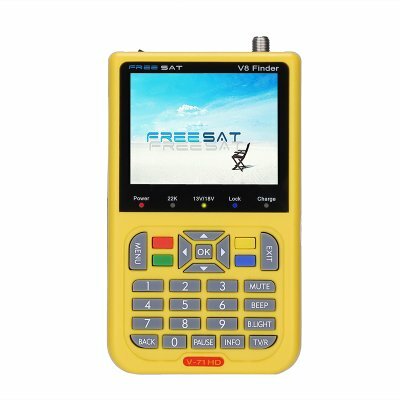 Successfully Added Freesat V8 DVB-S2 HD Satellite Finder - 3.5 Inch LCD Screen, 3000mAh Battery, 6000 Channels, AV/HDMI Out Function to your Shopping Cart. USB port makes it easy to update manufactures software. The FreeSat V8 makes setting up your satellite TV quick and easy. This professional satellite signal finder has a fast response and frequency range of 950MHZ-2150MHz. A 3.5 inch color screen gives a clear readout and also shows the live signal feed, so you can select the channels with ease. Having an HDMI and AV out lets you verify the channel quality on your TV without having to disconnect the satellite finder. With full DVB/DVB-S/DVB-S2 compliancy the FreeSat V8 meets all the broadcasting standards and will make the installation and setup of broadcast television and radio through tuners and setup boxes quick and easy. Thanks to a 3.5 inch color screen you can view each channel as you set it up on your system. This satellite signal scanner has over 6000 programmable TV and radio channels. Combined with the 8 favorite group selections you can create custom lists for streamlined setups. A 3000mAh battery brings 4 hours of usage time between charging and with an car charger included you can top up the battery on the go. The FreeSat V8 also has a USB port, so you can update the system when new software is rolled out from the manufacture. Coming in a protective carry case and shoulder strap this DVB-S2 channel finder is a great addition to any satellite installers toolkit. Thie FreeSat V8 signal scanner gadget comes with 12 months warranty, brought to you by the leader in electronic devices as well as wholesale audio visual gadgets..